If that thought has crossed your mind, STOP. You do not need to do an internet search on how to do a spell. There is no right way or any certain way to do any spell. In my opinion, beginner witches shouldn’t be doing spells, honestly. I feel that you need to have a personal relationship with your chosen deities before you start asking for assistance of things. They need to know you’re serious. They need to know you aren’t just going through a ‘phase’ and want to see if you will get what you ask for before you commit. Well a spell isn’t something that requires a list of exotic and expensive ingredients. As a matter of fact – I get a bit insulted when I see ‘witchy stores’ offering spell kits. I feel that when it comes to spell casting there should be no convenient alternative. I don’t feel any spell should be offered in a zip loc bag for the low, low price of $19.99. From a business point of view, I can understand why they do it. However, I feel a better alternative would be to offer ‘make your own spell kits’ where a customer can pick a candle, an herb, an oil, piece of parchment, incense, and a crystal. That’s just how I would do it if one day I live my dream of having my own ‘witchy store’. A spell is simply a prayer. A prayer that has been strengthened with other items. Some spells are as simple as thinking of something really hard – or as elaborate as acquiring crystals, specific herbs, etching a candle, burning a special candle for 7 days … the list is endless. The bottom line is – all spells are a prayer with focused intent. I heard to do a spell you need x, y, and z. No. You don’t. Not unless you personally feel you must have those items to strengthen your intent. The more you do yourself for the spell, the more powerful it will be. If you simply punch “love spell’ into a search engine and write everything down word for word, gather the exact things the internet says to gather, do it at the time the internet said to do it – how completely pointless. I imagine that for the God and Goddess hearing spells like this is like going and hearing a really bad cover band. I can understand becoming stuck while trying to write a spell. It happens! But I personally feel that casting spells should be done once you have a personal relationship with your chosen deities. That is because the human mind is very powerful. The saying “you can do anything you put your mind to” is very true. Anything you put out to the universe can be done. Does it always happen? No. Why? For the same reason that we aren’t all millionaires. The potential is there. Anyone could be a millionaire. Yet we aren’t all millionaires. Spells are the same. We can all cast spells. Should we? No. When is the best time to cast a spell? When you aren’t angry. When you aren’t sad. When you are totally emotionally stable and have meditated on the focus of your spell for at least 48 hours. Why? Well this is to be sure that if your intentions aren’t entirely good that you have time to back out before its too late. Sometimes we think we want things, but all too often we wish we could go back and change it. In my path there is no repentance. You will pay for your mistakes no matter how sorry you are for them. Eye for an eye. Can’t you only cast spells at certain times of the week/month/moon phase? Some people think so. There are people who believe that if you want to cast a protection spell it should be done on Thursday night between 8pm and 11pm in the New Moon with a black candle, a mirror, a piece of quarts while burning blue sage. I, however, do not think this. I think any time you need to cast a spell and you are in control of yourself – do it. I am not entirely comfortable only doing things when I’m told by someone else they need to be done. Sabbats are different. Spells, I feel, are personal. 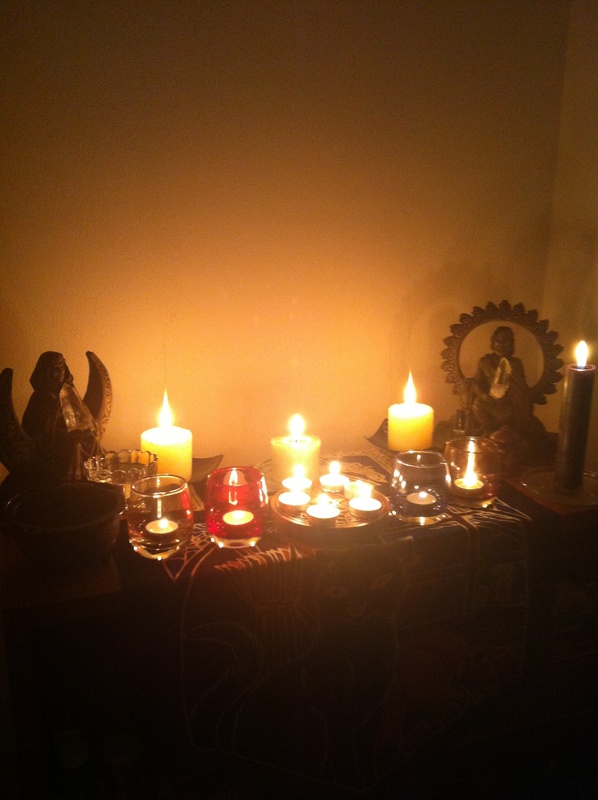 Rituals when done with a group/coven are less personal but still powerful. I have never been part of a group that does spell work together. I just heard about witchcraft and I want to cast a spell. Who am I to say you can’t? No one. But I like to tell people “I just heard about heart surgery and I want to do a transplant on you”. It doesn’t work that way with anything else in the universe, so why should it work that way with witchcraft? It shouldn’t. It doesn’t. It won’t. Try doing a daily devotional for a few months first. Get familiar with what it feels like when you are charged with energy. Get familiar with how to release that energy in a focused way in order to empower your intent. Have a conversation with your chosen deities every morning when you get up. Tell your deities what you would like to focus on that day (example: let me have patience with co-workers today) and start from there!